Rep. Bart Stupak will have a primary challenger as the November midterms approach. 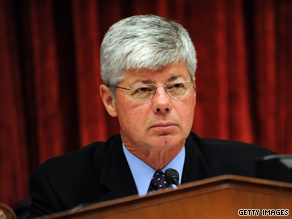 Washington (CNN) - Rep. Bart Stupak, the pro-life Democrat from Michigan who has made legislative language over abortion funding a flashpoint in the debate over health care reform, is now facing a primary challenger from the left. Connie Saltonstall, a former Charlevoix County commissioner and retired businesswoman from Charlevoix, Mich. who announced her primary challenge Tuesday. "The main issue is he was willing to sacrifice health care reform because of abortion funding," Saltonstall told CNN. "He's been my congressman for many years. I have compromised voting for him because of his position on choice. Health care and choice are two issues I am especially concerned about." Saltonstall also says she will continue her campaign regardless of the final abortion language in the health care bill, or Stupak's vote. "The people in our district lost trust in him. At dinners, he did powerpoint presentations on health care telling us he was going to introduce amendments, but telling us he would support health care regardless of the amendment. But then when the amendment passed, at his press conference he stated if his amendment language was not included, he would take the bill down. He has continued to say he would not vote for the health care bill unless his language was put in," she explained. The two rivals have a political history together. Saltonstall admitted she has voted for Stupak and worked as a volunteer on his campaign in previous elections. Stupak also endorsed her during her most recent campaign – an unsuccessful bid to represent the 105th district in the Michigan House of Representatives back in 2008. Saltonstall admits that defeating a sitting member of Congress will not be easy. Stupak was first elected to Congress in 1992, and has won by double digits in five out of nine campaigns according to the Almanac of American Politics. He easily defeated his most recent primary challenger during the 2000 election by a whopping 89-11 margin. "As a realist I know that defeating an incumbent is difficult," Saltonstall explained. "But I also know that there are many past supporters who have told me they have voted for Bart in every single election and they'll never vote for him again. It will be a lot of hard work, it will be a serious challenge, but we're going to try because the voters of this district deserve a choice." Updated: 8:58 p.m.: Michelle Begnoche, press secretary for Rep. Stupak, issued a statement in response to news of Saltonstall's candidacy. "The Congressman is not surprised by a primary opponent considering the recent controversy surrounding the Stupak Amendment and health care. He plans to prepare for an aggressive, spirited primary race and looks forward to participating in as many debates, candidate forums, festivals and parades as possible throughout the summer while maintaining his solid reputation for effective constituent services and legislative accomplishments." I'll be sending my money to Stupak, he's a leader not a louse. Too bad I can't vote for her!!!! I love all these democrats slamming Stupak as holding up health care. My goodness, what is he holding up? Obama's exchanges for getting into cheaper insurance policies don't start for 4 years after you pay for them first for 4 years. And then in order to get union support they don't have to pay for 8 years now instead of the 6 they didn't think was good enough and therefore threatened to withhold. their support in the November elections. Obama did that little goodie all by himself in the WH. Then you get mad at Stupak? Sorry, but one sane voice is better than none. And just remember if Reid hadn't bribed Nebraska at the expense of every other taxpayer in the country forever, to pay extra taxes to get his vote, or Landrieu hadn't got her kickback or Sanders didn't get his 600 million for Vermont, then the bill would still be sitting in the Senate where it should be. This man needs to go away.He's wrong on all counts. It's one thing to tell a woman what to do to her body, and it's another thing when you stand by and watch thousands die each year due to no or inadequate insurance. Pro Life my rear-end! He has no concept of what PRO LIFE means! Get a clue and another job!! This woman challenging Stupak sounds like virtually all other members of the Democrat party, to wit: a virulent, militant, hysterical, fundamentalist, extremist, leftist nut job and America-hating whacko. Also, like all other male or female feminists, she's dumber than rocks to boot. ALL "Blue Dogs" must go! The number one priority of the "real" Democrats should be to UNSEAT these Dinos....and that is the ultimate insult to that purple dinosaur pup from the Flinstones. These men and women are pig pooooo.....just like the RepubliKlans! Stup(id)ak you can kiss your 15 minutes of fame goodbye. How dare you pretend that you are interested in the people. Women can speak for themselves and do not need you or your arrogance. To threaten to give a GOP vote is not any thing for you to be proud of. This will be your last year. We don't need you. Pretend that you have a conscious and vote for what millions of people need – healthcare reform with a public option. I live in his district and I'll be happily donating to Connie's campaign and voting for her in the primary. I'm a Dem, but he doesn't represent me on Healthcare reform, abortion rights, sensible gun laws, and a number of other Dem issues. Time for him to go! As soon as she has her campaign site online, I am putting my money on her. Nothing will give me greater pleasure than unseating the poster boy for everything that is wrong with Washington! Yeah! How dare he oppose abortions! All logical people SUPPORT abortions! Everyone should be forced to have an abortion so they realize it's not really that bad. You don't even feel like you're killing a baby if you don't look. Who subsidized your rent for 7 years Stupak when you stayed at C Street?